There is only one challenge in this penultimate week of competition - a mini version of Iron Chef America! Ok, so maybe the exclamation point was completely unnecessary in that unexciting sentence. But how about in this one: Only one more week to go! Yaaaayyyyyyyy!!!!!! Definitely good news! 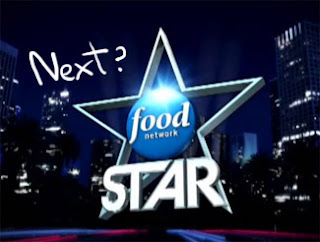 So our four remaining Wanna-bes - Vic, Mary Beth, Susie, and Jeff - go to the Food Network Studios to find it made up to look sorta kinda almost like Kitchen Stadium. 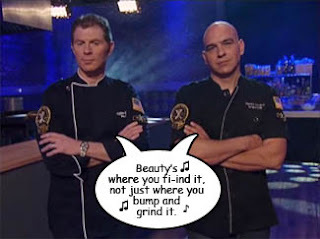 Alton Brown is there, along with Iron Chefs Bobby Flay and Michael Symon striking a pose. The Wanna-bes will compete head-to-head in two successive contests, during which time the other two will provide Kevin Brauch-style commentary. Also, each finalist will judge his or her opponent's dishes. 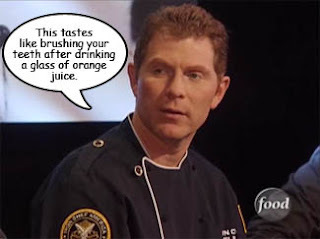 As winner of the last challenge, Jeff is allowed to choose his opponent, so he picks Susie, which he later realizes was probably dumb as she's the strongest cook in the bunch. 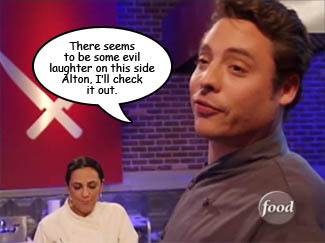 Alton then calls out the sous chefs who are lurking backstage. They are of course the last four Wanna-bes eliminated - Whitney, Jyll, Middle Eastern Penny, and Frat Boy. Jeff gets to choose his sous, and wisely takes Whitney; the rest are determined by chance. Susie gets Frat Boy, Vic gets Jyll, and it's not entirely surprising that Mary Beth is forced to work with Penny yet again. 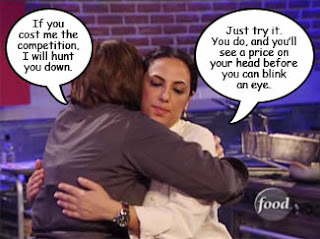 The first battle - Battle Rack of Lamb - is supposed to be between Vic and Mary Beth, but we know the real battle is going to be Mary Beth and Middle Eastern Penny. MB has decided to do three Sunday Suppers that are essentially the same - lamb chops with a side - but changing things up so they represent the seasons. Vic, meanwhile, is being far more creative and preparing a carpaccio and a lamb burger. 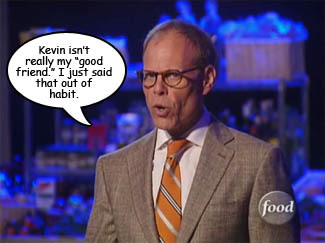 Vic thinks that he's super clever because LAMBburger sounds just like HAMburger, but wow - different meat! Holey Cow Ewe, won't the judges be surprised! If they are, that's just sad. After some (but not enough) thought, Vic decides his third dish will be a grilled lamb chop with a mint jelly and Grand Marnier sauce. Just typing that makes me feel queasy. On Mary Beth's side of "Kitchen Stadium," Penny is being distracting by moving so slowly. Personally, I'm distracted by all the hygiene rules she's breaking by wearing her hair down over her shoulders. 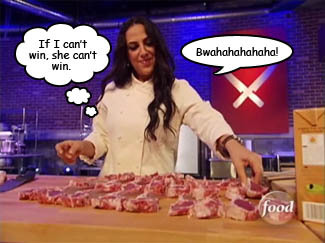 MB realizes that she's essentially alone in this competition and uses Penny only to slice her lamb racks into chops. Jeff, meanwhile, is trying to kill Susie in the commentator wars and is charming the pants off of the Bride of Fogelstein, as usual. After the hour is up, Mary Beth takes her place at the judges' table along with Giada, Bobby, Mike Symon, Tushface and Bride of Fogelstein. Vic serves his carpaccio, which the judges think shows finesse. They love his lamb burger (OMG! A burger...made of lamb! ), too, but think his triple-fried fries are mostly burnt. And then that abominable third course comes out, with its ultra-sweet sauce, and makes the judges gasp in horror. Mary Beth serves next and she's feeling a bit cocky. Because she sat at that table for a few minutes, she thinks of the judges as peers. However, it's clear they're not feeling the same way. They were excited to taste her food, but then when they do, they're not so excited anymore. While her first course is good, it lacks in execution. The lamb in the second and third courses is overcooked, and the worst thing on the plate. Giada tries to make Mary Beth feel better by saying that she loved her stories. But too little, too late. It's not looking good for MB. When that ordeal is over, it's time for Jeff and Susie to commence to cooking. Their secret ingredient is lobster, which makes Jeff groan a bit because lobster can be easy to overcook. To keep with his Sandwich King theme, he's making a lobster roll, a "BLAT" (bacon, lobster, avocado, and tomato), and a Baja-style lobster taco with radicchio fennel slaw. Susie is infusing her lobster with Mexican flavors by making a ceviche, an enchilada, and a stew with a potato cake. Mary Beth is obviously far more comfortable with commentating than is Vic (possibly more comfortable commentating than cooking, too). Alton, who is apparently feeling extra bitchy today, probably because he hasn't eaten all week, catches Vic offguard by asking what is in the harissa paste that Susie has out on her board. 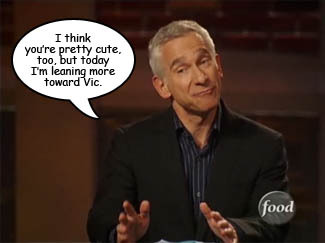 Vic doesn't know and ad libs an answer that makes Bobby crack up, but doesn't show much food knowledge. Mary Beth has much the same issue when Alton poses the trick question, "what salt is not sea salt?" She ponders it a bit but has no answer. 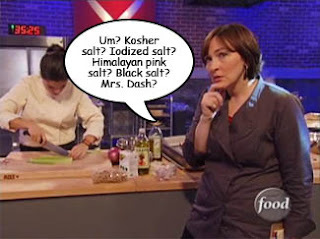 Know-it-most Alton then tells her that ALL salt is sea salt. So there! Jeff realizes there's no avocado in the kitchen so his BLAT idea goes SPLAT. Now two of his sammies are a bit too similar, especially since he's using store-bought mayonnaise on just about everything he's touching. Time flies in Kitchen Stadium and mercifully even faster in Kitchen Stadium, Jr. Jeff serves his Lobsterfest® first. Despite the very untraditional presence of walnuts, the judges think his lobster roll is incredible. Tushface says Jeff is really mastering his POV. While the batter on his lobster taco is too thick, Fogelstein loves that he's reinterpreting the sandwich. 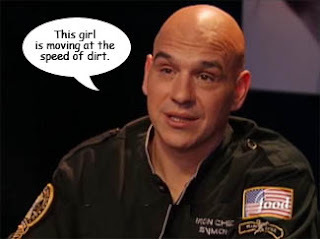 But they all noticed the preponderance of store-bought mayonnaise that Michael Symon says could have been perked up with a bit of fresh lemon. Next up is Susie who is, as usual, heaped with praise. Her ceviche was very successful, vibrant and flavorful. Her enchilada was a "perfect spin on a traditional dish," with perfectly-cooked lobster. And Tushface thinks her lobster stew is a "heaping portion of sizzling sunshine." Wait, I thought that was Giada? The next day, the Wanna-bes appear before the Selection Committee. Mary Beth gets the most comments, which means she's probably out. The judges realize she was handicapped by her sous chef but weren't letting her have that excuse. 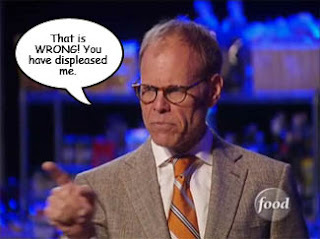 Her judging and commentating were both terrific, but Bobby felt the execution of her food was only at about 75%. On to Vic. His lamb salad and burger were the most successful of the six lamb dishes they tasted, but the lamb chop with mint sauce was the worst of the bunch. His commentating wasn't all that great, and he was too nice during his stint as judge. 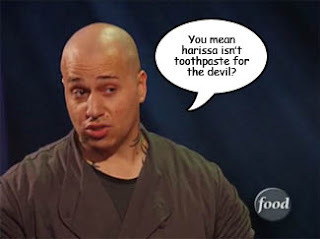 Come on, it's not like he's ever going to be an actual Iron Chef judge! That's a privilege reserved for people like actress Cady Huffman and athletic wear manufacturer Marc Ecko. You know, food professionals. On to Jeff, whose biggest issue was not making his own mayo, which he blames on time constraints. The Selection Committee praises the way he charmed Alton Brown during his stint as commentator, and they also liked his judging. 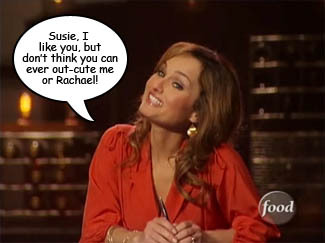 Finally, they gushed over Susie and her fabulous food. She was a good judge, too, without being harsh, but they felt her commentating wasn't up to snuff. The winner of Battle Lobster is Susie. The winner of Battle Lamb is Vic. 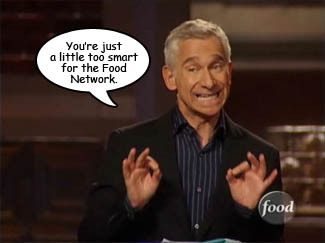 That means Jeff and Mary Beth are up for elimination. 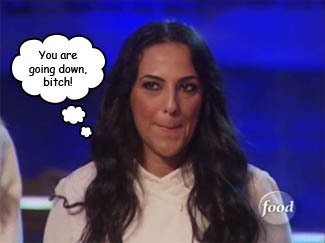 While MB has "talents that just can't be taught," she doesn't really seem to have the cooking chops. 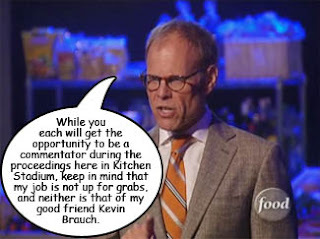 Jeff didn't impress Giada, but both Alton Brown and Rachael Ray thinks he has real star power, and that when he gets it, he gets it right. And he got it right enough this time to stay on in the competition. Mary Beth, on the other hand, is out. Although I liked her very much, I knew she wasn't the right fit. I think the judges did, too. Next week - the Finale! Finally!